Collectors of garage and psychedelica records are seemingly a very strange bunch. Once you get beyond Nuggets and various other compilations, good underground psych records tend to get really rare, especially considering that there were only a finite number of albums or singles released in the genre during its heyday. 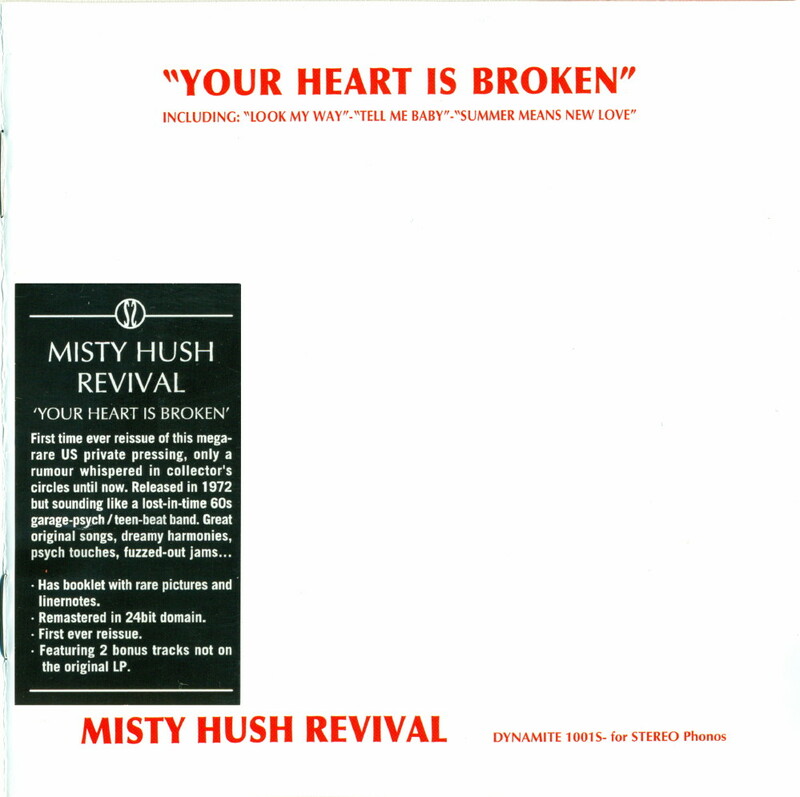 So that’s why when a really obscure find, such as Misty Hush Revival’s sole 1972 album Your Heart Is Broken, sees the light of day, and gets a pressing a bit less modest than its original 100 or so copies that were largely distributed to friends and family some 40 years ago, the words “lost classic” tend to get bandied around. I won’t mince words: Your Heart Is Broken is no long-lost classic. It’s simply a document by an amateur garage band out of tune with the times. By 1972, this type of music was getting heavier and blusier, and Misty Hush Revival’s music is so soft that it more or less makes the Lettermen look like Blue Öyster Cult in comparison. In essence, Misty Hush Revival could have been one of a million bands of the era that simply didn’t make it because they didn’t have very much to offer. In fact, they had only one really good song in their arsenal: the laconic, trumpet-filled ballad “Summer Means New Love”, which alas gets a somewhat unnecessary reprise here with all sorts of live band banter edited in. The remainder is just OK. Even though there’s not much that is musically special about Your Heart Is Broken, it still is a fascinating period piece. You really get the sense by listening to this album that you’ve uncovered found footage of what it must have been like to be a struggling musician 40 years ago in the New York City area, thanks largely to those paradoxically unnecessary edited-in interstitial bits and a brief journalistic interview committed to tape that opens the album. That’s the real benefit of hearing this record. In fact, it might make you feel a little wistful and nostalgic, if not outright depressed, that this was the only artistic statement to be released by this band, and it was the only recording they did before moving on to seemingly more sensible careers. There’s a remarkable wholesomeness to the proceedings—some of it sounds a little bubblegum-ish – and that makes it a sort of “family photograph”, if you will, that’s stunning to listen to, as though you’ve been invited into someone’s private world for cookies and tea. So, yes, Your Heart Is Broken may not be the long-lost classic that obscurists may be scouring for, but it is still something worth listening to for those with a historical bent and who are alternative world fetishists. Nothing much may have come about for Misty Hush Revival – and, yes, the name is a bit ridiculous (what is a “misty hush” to begin with?) – but even though it is musically a very mixed-bag, it offers its own small rewards with subsequent listens, which may appeal those select few collectors running out of new-old garage rock or psychedelic records to discover. One of the most obscure U.S. private pressings from the late '60s/early '70s. 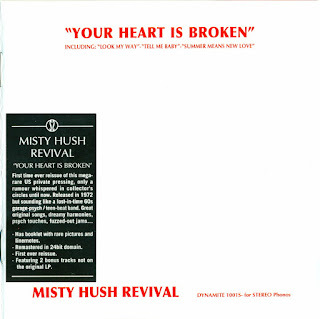 For many years, The Misty Hush Revival name was only a rumor whispered in collector's circles, with only a handful of copies known of the original album around today. Like The Bachs or The Index, this is one of those hard-to-describe albums which seems to live in a world of its own. Despite the late 1972 release date, the music here sounds more late '60s than early '70s and the whole album has a cool, lost-in-time atmosphere. The group were in fact a club band from New Jersey, but surprisingly all the tracks are originals -- no cover versions -- and they range from fragile, dreamy pop-psych numbers to raw garage, fuzzed-out jams and teen-beat sounds.